“An Israeli military commander says Tel Aviv is prepared to carry out an attack on Syria if the government of Syrian President Bashar al-Assad collapses. On Wednesday, Israeli Major General Amir Eshel said the Tel Aviv regime might launch a sudden war on Syria should Damascus fall. Kirwan - If Israel attacks Damascus again - it is likely that Syria, Lebanon, Iran & Russia, with China's approval, will counter-attack Israel and justifiably so! After the last attack on Damascus, Syria has been routing the "rebels" inside Syria and has retaken over 70 % of Damascus. This is why Tel Aviv feels that they must attack (again) because they are losing their own war, as the current war is being prosecuted by Israel & American mercenaries who are being defeated across the whole of Syria. This time if Israel tries to claim international-victimhood for their need to attack a country that has NOT attacked Israel there will be a BOMMERANG effect which will come back to devastate Israel, to the hilt, as should have been done years ago! The recent Israeli threat is seen as part of the Western-backed efforts to set up the scene for a military intervention in Syria. k) Israel has been attacking Syria and Lebanon since the 1967 war, under the guise of needing to protect itself by attacking other nations. Israel, with its bizarre version of protecting itself by attacking any nation, without any historical evidence of direct-military-aggression upon it, is not only obscene it’s insane. 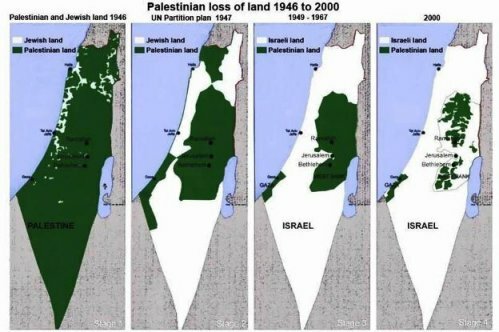 Since 1948; the land of Palestine has been reduced to something less than one­eighth the size of the nation that Israel fought and conquered in 1948. However every effort by Israel to expand their land-grab from what they got in the ‘48 war, has failed except for the Golan Heights, which Israel simply stole outright, from Syria. Despite the 1967 war against all the Arab countries, with US assistance, Israel is still confined to her original place inside occupied-Palestine. The current impasse is designed to let the rabid-state of terrorism out of the cage she’s been confined to since 1948. Lebanon has been repeatedly attacked by Israel, and has only survived by having Hezbollah resist Israel to the point that the IDF was forced back across their border, as if nothing had happened. The last such attack happened in 2006 with the UN and the US running interference for Israel. Despite Israel being able to hold the whole world hostage over this, she could get no further into Lebanon than 5 miles. Israel had the overwhelming military force, yet they lost to Hezbollah, in a universal disgrace! Syria has been under attack for the last two years by mercenary rebels and Israel-USI, but has so far survived the obscenity. Iran was attacked by America twice and again for eight years by Iraq, as our surrogate under Saddam: Yet the nation of Iran has survived without attacking any other nation outside their borders (for the last 300 years). Consequently the only rabidly-aggressive-force in the Middle-East is, and has always been, Israel. Now Israel wants to bomb Iran and Syria again, to distract the planet from the collapse on every other front, worldwide: And of course to supposedly end the “threat” which Israel plans on turning into an expanded Israeli-State. “On May 5, Syria said the Israeli regime had carried out an airstrike targeting a research center in a suburb of Damascus, following heavy losses inflicted upon al-Qaeda-affiliated groups by the Syrian army. According to Syrian media reports, the strike hit the Jamraya Research Center. The Jamraya facility had been targeted in another Israeli airstrike in January. The May 5 Israeli aggression was Tel Aviv’s second strike on Syria in three days. Western powers and their regional allies including the Israeli regime, Turkey, Saudi Arabia and Qatar are partners in supporting the militant groups in Syria.” (1). It is worth noting that “TERRORISM” was created by Israeli-terrorists which terminated the British Mandate over Palestine in 1948. They called themselves “terrorists”. Through Harry Truman and the United Nations Israel used the Belfour Agreement that essentially gave them Palestine. Up until that time virtually every country that had harbored “the money-lenders” had thrown them out, all the way back to Ancient Carthage. The only major nation that has not evicted “the Jews” has been the USA. One other historical footnote is that today’s Israel claims to be the only Democratic-country in the entire Middle-East. In fact Israel has expelled Catholics, Muslims and actual practicing religious-Jews from their Zionist State: Thus making Israel an Apartheid State that is home to the Fourth Reich and global terrorists everywhere—along with the global-money-changers which go all the way back to biblical times. “When empires recognize they are losing too much in battles they win, it is past time to stand down. Unfortunately, empires become blind to reality and instead of withdrawing from battle, they plunge further downward toward their own demise. In their early-history the money-lenders concentrated on wealth accumulation to be created for others, solely based on money. Once the wealth they had been hired to create became a fact, the country’s that had imported the Jews, to do this service. were either killed or expelled. The Jews simply moved on into other countries. Once this folly had run its course the Rothschilds began developing their plan to literally own all the banks of the world—something which they have almost achieved, with the exception of Iran, Cuba, North Korea, Venezuela (questionable at the moment). Libya had once been one of the holdouts. Having had not only its own bank, but they were about to launch a gold-back Libyan dinar that would have freed Africa from the Rothschilds. That was one of the needs for erasing Libya from the community of nations. Israel has not been content just to threaten the entire world to get her way. 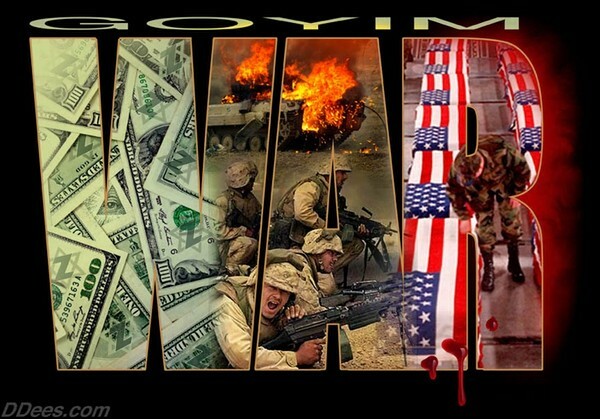 Israel has blackmailed the entire planet with her nuclear weapons. Currently Israel is in the final days of the execution of every man woman and child in the United States, with massive help from the Congress and the Tarnished House. This “vote” by the Senate runs counter to American law and the US Constitution because the Congress has been purchased by the Israeli government ­ outright! This vote was both High Treason & Sedition against America! What is about to happen to Israel is long overdue. This time-round other nations will join with Syria and Iran against Israel and the criminal-USI to defeat what Israel sees as a foregone conclusion: “Israel’s sole right” to dominate the rest of the global-population. The world needs to step up and demand an end to the rabid-savagery of Israel, or there will be no world left to argue about. would seem to be an ideal time for Israel to do the unthinkable deed. 1) Israel prepared to launch war on Syria: Israeli cmdr.